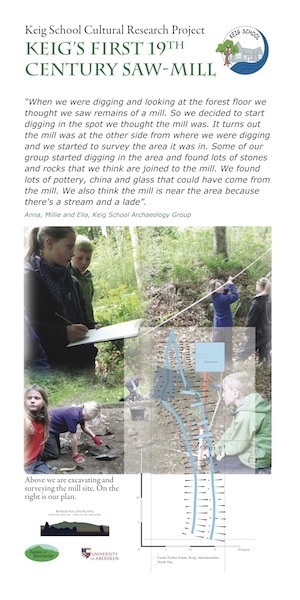 The archaeology project at Keig School has enriched the education of all the pupils far beyond learning the craft of archaeology, the local history and changes to the landscape. Pupils under the guidance of archaeologist Colin Shepherd have used primary sources to research information, have located places on maps, have participated in archaeological digs and followed the process from surveying the site, to cataloguing and displaying their finds. The skills they have used span the whole curriculum and have given them a real life interesting experience to develop their literacy and mathematical learning. All our pupils are very proud that they are unearthing the past of Keig and the new discoveries they have made about the local area. However, they have also learned to be open minded and creative. They have developed their natural curiosity by asking questions and leading their own learning. The impact of the project goes beyond the obvious formal learning as pupils have developed their skills in communication, cooperation and team work and of course have been able to experience the outdoor, local environment. It has also helped them to take responsibility for their learning and the site area. We see this project not as a one off event but as a sustainable and long lasting enhancement to the education of the pupils at Keig School which in turn they share with their families and the local community. Our latest focus has been an introduction of an Archaeological Responsibility group where the pupils lead the learning for the school. At the moment they are trying to fund and establish a community museum based at Keig School to display their archaeological finds. Our pupil’s next idea is to produce a historical, cartoon based on the exploits of the people of Keig as recorded in the Barony of Keig. Keig finished their school year continuing an excavation of an 18th century structure in woodland on the Forbes Estate. This appears to have been turf built with stone footings. The gable ends appear to be fairly robust whilst the long sides are lacking a strong base. At the moment it is not apparent whether this is as a result of subsequent robbing of the structure or simply that they never existed. It is hoped to continue this work in the new school year. Keig school are continuing their analysis of the pottery assemblage from their excavation. The finds will be exhibited in a small community museum to be situated in the school's entrance foyer. The pupils are especially interested in changes in pottery production techniques across the 700 year timespan of their collection. The school is also engaged in an arts project using the area's local history as its starting point. The documentary source being used is the 17th century Barony Court Book of the Forbes estate which describes Keig life through the lens of some of its more colourful inhabitants of the time. An early 19th c. mill site has been discovered along with an intact section of an 18th century road linking Druminnor Castle (By Rhynie) with the Boat of Forbes on the Don. 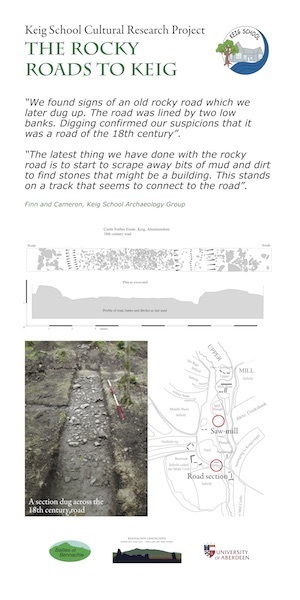 Excavation by the school and the Bennachie Landscapes Fieldwork Group has revealed a well-made and drained carriageway leading to a ford crossing the Burn of Keig as well as a lade feeding the mill. 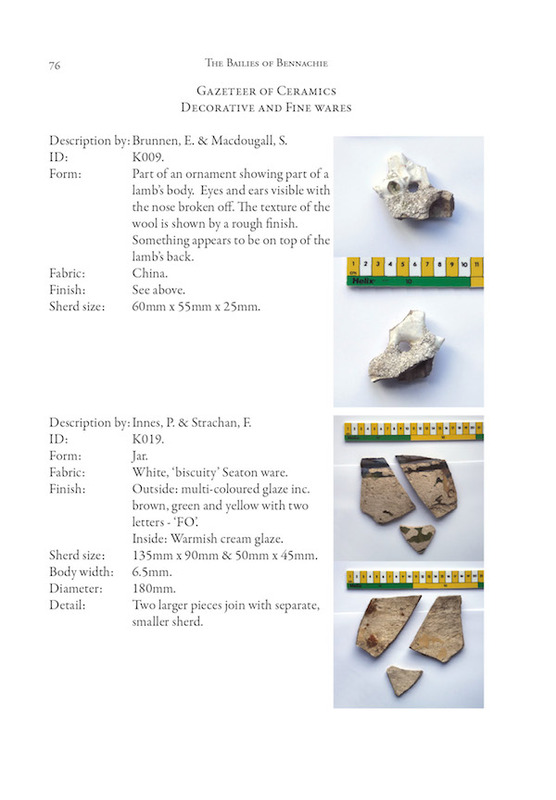 Medieval pottery from the mill site attests an earlier history that is still, at the moment, hidden. Future work will hopefully clarify this picture. Whilst carrying out fieldwork in the area of the mill pupils from Keig also discovered a 'midden' containing a mass of ceramics from the late 19th and early 20th centuries. These are described and illustrated in the most recent Bennachie Landscapes Series publication and reproduced below. (Copies of the 128 page colour book detailing last year's research on and around Bennachie can be bought from the Bailies of Bennachie for £8+p&p). 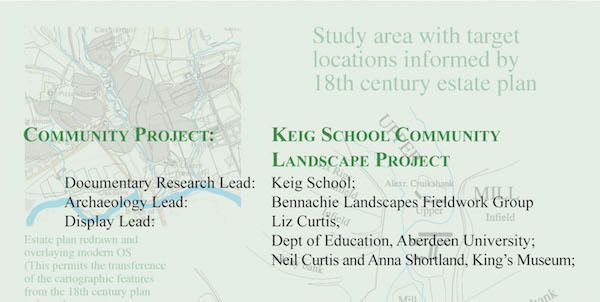 Pupils took part in a study of the parish of Keig. This involved studying documentary and cartographic evidence dating from the 16th to the late 18th century. These documents give a view of how the land was used and how it changed during this period. Fieldwork on the Castle Forbes Estate demonstrated the fossilised survival of important elements of this landscape within an area of woodland. The pupils initiated a programme of excavation of some of these features. This work work was continued over three weekends by volunteers from the Bennachie Landscapes fieldwork group. A section was put across an eighteenth century road, believed to be the first non-military road sectioned from this period in the county. The section showed a made ‘metalled’ surface with flanking ditches and dykes. Many questions concerning its construction and use have been posed by this work and the previously commonly-held view, prompted by the writings of Grant of Monymusk, that no such thing as a road existed in the area prior to the ‘Improvements’ is now open to serious debate. Two 18th century mills are shown from an estate plan to have been in existence in this limited area in the 18th century. Fieldwork has now found a separate lade, presumably related to another mill within the woodland. A section across this showed a well-cut lade in a wonderful state of preservation. Though nothing is shown on the 1st Edition OS map of the mid 18th century, a slightly earlier map by Thomson for 1832 appears to show the three mills in existence at the same time. One suggestion is that the middle structure was a short-lived saw-mill. Ongoing work hopes to be able to find the foundations related to this early mill and to determine its use. 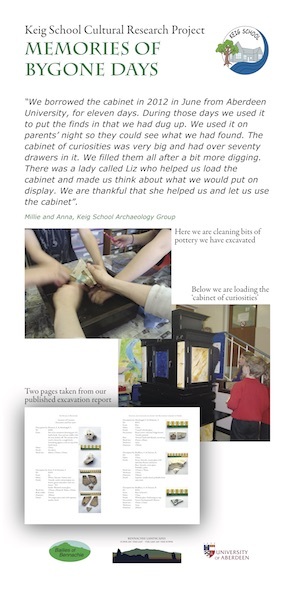 The findings of the pupils at Keig were exhibited with the help of Liz and Neil Curtis with the help of Kings’ Museum ‘cabinet of curiosities’. The students attended a workshop at Kings considering questions of curatorial procedure and were helped to put on their own display for the local community by Liz Curtis. Work continued over the winter months with the pupils cleaning, cataloguing and describing their finds. This was completed using spreadsheets supplied by the University of Aberdeen and in accordance with the project’s methodology. With the better weather the pupils have now returned to the site. The younger ones are shovel-pitting in the area of two structures recorded on the 18th century estate plan and the older ones are beginning to carry out a detailed survey of the earthwork remains by means of taped offsets.